I am often asked why most of the Polish tours have at least one church in the itinerary… Sometimes it is describeb with an expression: “ABC” (another… church). In Poland – so dreadfully destroyed during the last great military conflict which was the Second World War – sometimes the only REAL art is located only in churches. It is worth remembering that a great lot of the splendid art that Poland was furnished with – was simply STOLEN by both armies (first the German and then Red Army). Earlier in the history there was a Polish-Swedish military conflict, which resulted in a great Polish loss of art as well as architecture (just to mention the Krzyztopor castle in Ujazd) and what should be NOT forgotten – is the Napoleonic period – which also resulted in plundering and destruction of Polish art and goods. After WW II that art that was luckily found or (more rarely) claimed – was placed in museums. Unfortunately many Polish museums still do not have the knowledge of how to display the possessed art. Besides – not everybody likes (or has time enough) to visit museums. Another thing is that Polish museums still do not have the opinion or reputation as (for example) the Rijksmuseum has. Another thing is – that most of the foreign visitors think Poland still is a country far, far behind the world. Common opinion says that visiting the museums in Russia, or Western Europe gives more art reflection. Yes it does – but among their exhibitions – there are many pieces that come from Poland. Think of it when you stand in front of a wonderful huge Beer Mug with coins in the Louvre. Do remember please, that it was made in Gdansk :), not to speak of a variety of art held in the Hermitage. Thought was then free only in this manner; hence it never wrote itself out completely except on the books called edifices. Having thus only this resource, masonry, in order to make its way to the light, flung itself upon it from all quarters. Hence the immense quantity of cathedrals which have covered Europe–a number so prodigious that one can hardly believe it even after having verified it. All the material forces, all the intellectual forces of society converged towards the same point: architecture. In this manner, under the pretext of building churches to God, art was developed in its magnificent proportions.Then whoever was born a poet became an architect. Genius, scattered in the masses, repressed in every quarter under feudalism, finding no issue except in the direction of architecture,–gushed forth through that art, and its Iliads assumed the form of cathedrals. All other arts obeyed, and placed themselves under the discipline of architecture. They were the workmen of the great work. The architect, the poet, the master, summed up in his person the sculpture which carved his façades, painting which illuminated his windows, music which set his bells to pealing, and breathed into his organs.Architecture was, down to the fifteenth century, the chief register of humanity; up until that interval not a thought which is in any degree complicated made its appearance in the world, which has not been worked into an edifice; that every popular idea, and every religious law, has had its monumental records; that the human race has, in short, had no important thought which it has not written in stone. And why? Because every thought, either philosophical or religious, is interested in perpetuating itself; because the idea which has moved one generation wishes to move others also, and leave a trace. Now, what a precarious immortality is that of the manuscript! How much more solid, durable, unyielding, is a book of stone! In order to destroy the written word, a torch and a Turk are sufficient. To demolish the constructed word, a social revolution, a terrestrial revolution are required. The barbarians passed over the Coliseum; the deluge, perhaps, passed over the Pyramids.In the fifteenth century everything changes.Human thought discovers a mode of perpetuating itself, not only more durable and more resisting than architecture, but still more simple and easy. Architecture is dethroned. Gutenberg’s letters of lead are about to supersede Orpheus’s letters of stone. Oliwa Cathedral is one of Europe’s best kept secrets. It is the longest post-cistercian church in the world (about 107 meters long) with exquisite accoustics. And besides the marvelous pieces of art which can be seen HERE – the cathedral has a hit of the region – an exceptional organ. It has 7876 pipes, and 110 real voices (87 of which are in the main instrument, and 14 in the cross-nave). Whoever comes to Gdansk, even having vague information about the city – knows one – the Oliwa Cathedral is definitely MUST SEE, when in north Poland. 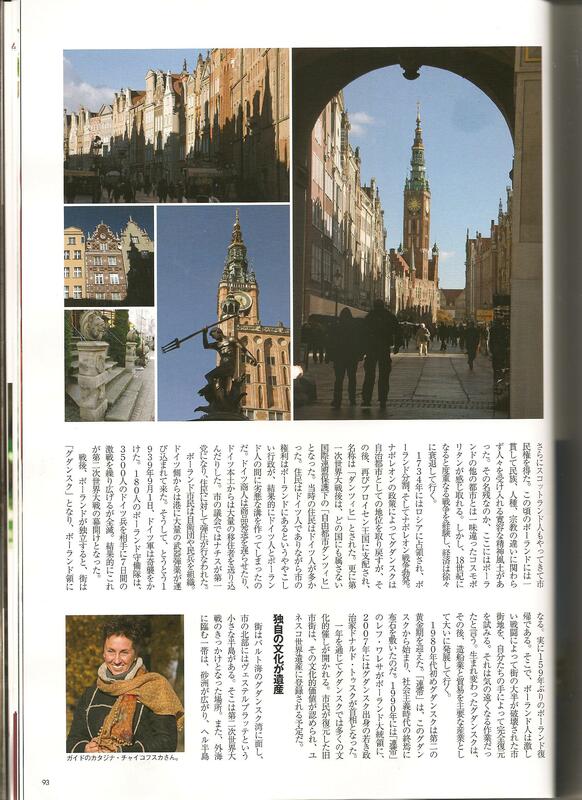 Some time ago, I had a pleasure to be guiding a group of Japanese journalists form a prestigious magazine. They came to Poland to write about the country and its possibilities of development. The publication is called Excellent Poland Rising Polska vol. 1. And it is printed on a high quality thick paper (“art-paper”), with beautiful photographs, and thorough information. So I awaited at the Lech Walesa Airport for a group of three persons. They finally emerged from the arrivals – without their luggage, which probably circled the world somewhere between Japan and Poland… I thought it was not the best start, but suddenly the sun came out from among the clouds, and the day turned really beautiful. Although my guests were quite tired, they did not want to have any rest, nor meal, as their schedule was quite packed with events and meetings. Besides they wanted to see Gdansk. And – they wanted to take some pictures for their future publication. So I promised, I would show them a very good spot to take extra photos of the city’s panorama. After all the meetings, well after sunset I took them to the promised spot, where they could admire the view across the river Motława. One of the evening photos from this place that my guests took, can be found in the publication I have in my hands. It really is beautiful. The time of their visit came to an end, and after exchanging business cards, and I got a promise of a copy of this publication. So yesterday when the postman brought a large envelope stamped in Japanese I was glad that they finished editing. Inside there awaited a great and a very pleasant surprise! My guests posted a picture of me. Thus, I had to write this post – to simply show off, as I am very honored with being pictured in such a prestigious publication. Since childhood, I have always been fascinated with the colors of the water in the Baltic Sea. Whenever we were sailing to Gdansk – my Dad used to wake me up early in the morning, so that I would see how the Gulf of Gdansk changes colors. From grey, or blue-grey – to green, or brown-green, the colors were changing depending on the light or the time of day. Today I took my camera and went to the beach to take some photos of the sea. When I came there – the water was grey-blue. And in the far distance, on the horizon, I could see the dark shadows of heavy rain or a snow storm. The water there had the color of dark graphite. It was hard to say where the sea ended and where the sky started… And suddenly the colors changed. I stood amazed – when I saw green water, and the swans in a vivid contrast with it. HERE is a link to my photo-blog. I posted there some photos of today’s Gdansk. And for the thousandth time or so the Long Street Gate attracted my eyes again. It was once an ordinary medieval brick gate, just a gate, one of few leading to the town. And then in the 17th century, there came the time of changes, great changes in Gdansk. All the construction activity in the town must have been unnerving and irritating to the citizens, as it is for us today. The Gate is associated with a certain surname of a master builder and artist at the same time – Abraham van den Block. The figures on the gable were made by Peter Ringering in 1648. But in the 19th century were taken away. So when after the Second World War destructions of the city – the decision to bring them back was made – there were no originals. There were only the copies from 1878… Speaking of the WW II destructions – I mean – we all mean – the destruction caused in March 1945 by the victorious Red Army. The town was then systematically destroyed by them while chasing the Germans out from it. House by house, street by street it was burned down. There was such a heat, that many of the bricks melted, and altogether after the fire ceased, the Town was filled with 3 million cubic meters of rubble. So when looking at the splendidly rebuild and in places fully reconstructed town, it is worth to remember that tragic time to. The Polish restorers indeed have done their job perfectly. No wonder that they are known in the World, and often called to work abroad. But going back to the Golden Gate (I don’t like this name as the historical name of the Gate is: Long Street Gate, but most of the guide books use this popular one)…Looking at it now – we see the effect of the last renovation – which was not a perfect one. But nevertheless we admire it and concentrate on the load of meaning it has, not noticing the shortcomings. So I stood there, gazing at the nicely illuminated Gate in admiration. I was trying to fit the figures in my camera lens and reflected on the depth of content of the ideological meaning of the decoration. Whole town is full of ideology, and the Gate is like a short description of how to understand it. So here we have – (looking from the west) – figures depicting Peace with palm twig and a stick entwined with olive twigs. This means triumph and victory. Next is the allegory of Freedom – holding a hat (pileus) and a statute book. Pileus was a sign of freedom, as it was placed upon a shaved head of the newly freed slave in ancient Roman times. Next we have an allegory of Abundance – and it does not need any explanation – the Horn of Plenty is all too visible. And the fourth figure on the western gable of the Gate is Fame (Pheme). Here it holds the horn of Fame and the sun (symbol of eternal eminence) and tramples down Envy (Invidia). And yet it is not the end of “reading” the Golden Gate (Long Street Gate). It is best to stand in front of it, either from the west, or from the side of the Długa (Long) Street and listen to what it tries to say about the ambitions of citizens. And about the then position of the City.